Some of the most beautiful fruit in the market right now are the Fuyu persimmons with their glossy skin and brilliant orange color. They’re so attractive that many people buy them just to display in bowls as part of their holiday decor. It would be a shame, though, to let such sweet and spicy fruit go untasted. Unlike their acorn-shaped cousins, the Hachiya persimmons, which must soften to an almost jelly-like state before they become palatable, Fuyus are at their best when they’re still nearly as crisp as an apple. They’re great eaten fresh in a salad or even straight out of hand. I never really thought about baking with Fuyus, however, until I tasted a slice of homey apple cake from a local bakery not long ago. 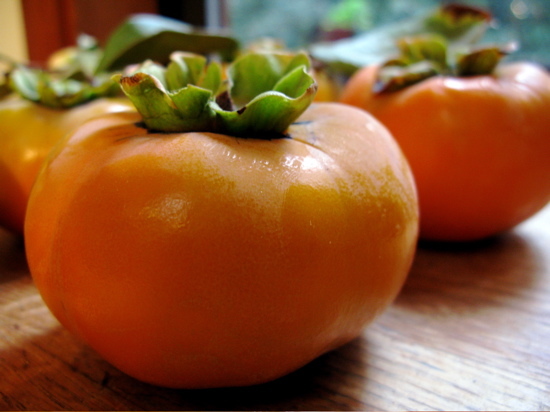 There was a bowl of persimmons sitting in my dining room and I had been looking for something new to do with them. For the first time, I looked at Fuyus in a new light. If they have a texture comparable to apples, I thought, maybe they, too, would make a good cake. The result was a simple, moist cake that would be right at home on a holiday brunch table. It’s spicy and lightly sweet, with the gentle flavor of persimmon underscored by a generous shot of orange juice. Not only is it easy to make, the flavor improves if it’s baked a day or two ahead. You need fresh, firm persimmons for the best cake. 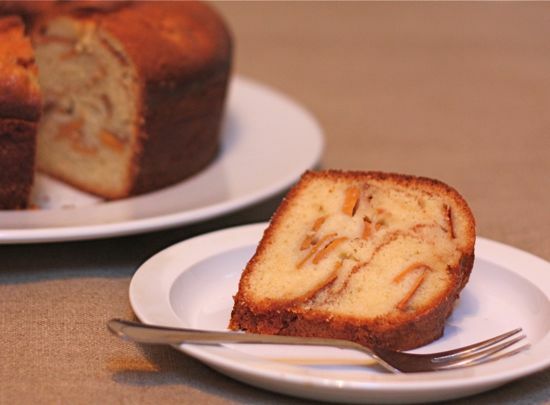 The version I made with persimmons that had begun to get soft wasn’t nearly as flavorful and some of the slices melted to mush during baking, leaving unsightly holes in the cake. It pays also to take care to evenly layer the slices, because the pattern is visible when you cut the cake. Inspiration for this cake came from an apple recipe in “The Way We Cook,” by Sheryl Julian and Julie Riven (Houghton Miflin, 2003), a collection of practical recipes for modern home cooks with very busy lives. Preheat oven to 350 degrees and butter a 10-inch tube pan. Line bottom with parchment paper cut to fit and buttered. Dust pan with flour and tap out the excess. Peel persimmons, quarter, core, slice thinly and set aside. Mix cinnamon with 5 tablespoons of sugar in a small bowl and set aside. Combine flour, remaining sugar, baking powder and salt in the bowl of a stand mixer fitted with a paddle. Mix at medium speed for a minute or so to evenly blend the dry ingredients. Add oil, eggs, orange juice and vanilla and beat until smooth. Spoon a third of the batter into prepared pan and top with half of the persimmon slices, keeping them away from the sides of the pan. Press slices lightly into the batter and sprinkle with half the cinnamon and sugar mixture. Repeat with a third more batter and the remaining persimmon slices and cinnamon sugar. Finish with last third of the batter and smooth the top with a spatula. Don’t worry if it doesn’t cover the persimmons completely. Bake on center rack of oven for 1 hour to 1 hour and 10 minutes. Test whether cake is done by inserting a skewer into the center. It should come out clean although it may feel a little sticky if it has gone through some persimmons. Cool cake in pan on a wire rack for 30 minutes before running a knife around the inside and outside edges of the pan to release it. Turn cake out onto the rack, remove the paper liner and let set right side up to finish cooling. Although it’s delicious as is, a little powder sugar dusted over the top is a nice touch. Thanks for the new-thing-to-do-with-persimmons recipe. It turned out wonderful. I was a little uncertain about how thick the mixture was, and it did require spooning into the pan, it was not pour-able. I think a dollop of freshly whipped cream on top is a nice addition. I really enjoy the seasonality of your recipes.